One of the great oxymorons of all time is said to be about military intelligence, because such a thing cannot exist. Just ask anyone who has ever served in the military and they will concur. In retrospect, wisdom seems to be severely lacking in much of our society. Often times I hear the so-called experts speak on various subjects and wonder if they realize what they are saying. I have a saying that I use to get into the craw of pretentious and overbearing know-it-alls: “I am from West Virginia and I figured it out.” That just drives them up a wall. However, wisdom is something that all good leaders need and should long toward. In our Old Testament reading, a young ruler does what most lack the humility to do and asks God for wisdom to lead. God, in his grace, gave Solomon exactly what he asked for and what he needed. 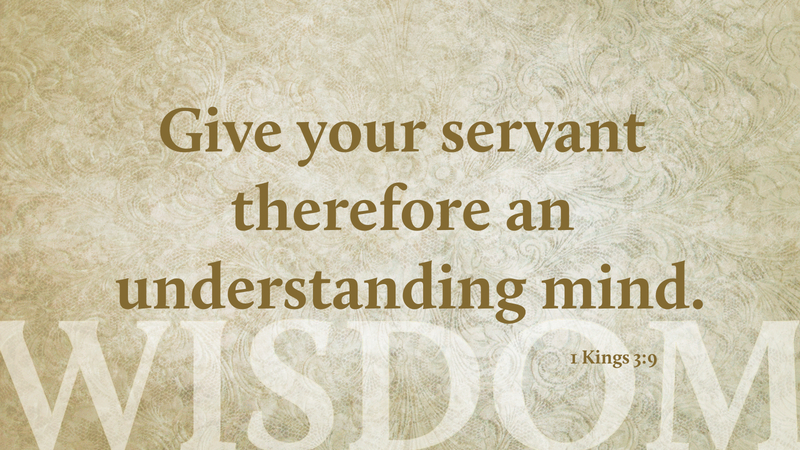 We, like Solomon, need to ask for wisdom, for this attribute is not just for kings and political leaders but for all. Wisdom is there for the taking if only we have the courage and humility to ask. Wisdom seems like a slippery slope. Everyone seems to think they have it in abundance, just ask any college graduate, but is something that takes years to develop. Knowledge, to me is being book smart. Wisdom is the ability to take the book smarts and be able to apply it to our live’s. Foolishness is the daily reminder to all that “I am a college graduate, I am 24 years old and I am mature.” We rely on God’s word, we study it and receive other Christian’s input to obtain wisdom. I am 66 years old and I will not profess to be “wise,” I know my shortcomings.